"We're With You Every Square Foot Of The Way"
What do you get when you put over 70 years of licensing and exam preparation experience behind one comprehensive test engine? 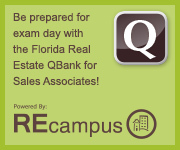 You get the power to pass the Florida sales associate licensing exam! You’ll be as prepared as possible when you test yourself with hundreds of questions on the industry’s most advanced interactive testing platform ever created. 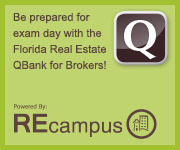 A salesperson candidate has to score 75% on the state exam to pass and you will be given 3 1/2 hours to complete the exam.